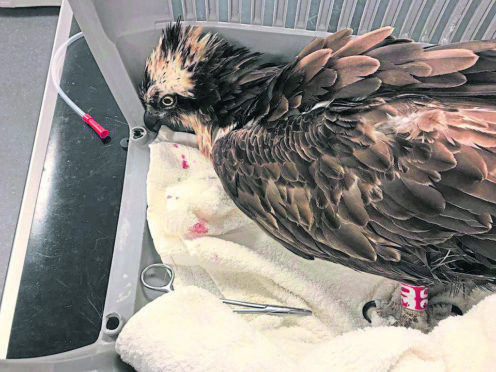 An osprey that crash landed in a field entangled in a fishing line at a north-east animal rescue centre has sadly died. Ollie was found in one of the horse fields at the North East Wildlife and Rescue Centre, known as New Arc, a fortnight ago. Despite operations to dislodge the fishing hook lodged in his throat, his recovery hit a wall and his condition rapidly declined. Vets decided the best way forward for the stricken bird was to put him to sleep. Charity founder Pauline Marley said: “Ollie crash-landed in one of our fields two weeks ago with fishing line wrapped around his neck and wing and, upon further investigation, it was found it went into his mouth. “We took him straight to Glenythan Vets where an x-ray showed the hook was stuck in his throat. “He was transported to Aberdeen Vet Referrals where it was successfully removed. “After that he started showing signs of improvement – to start with all of his food had to be liquidised but he had started feeding for himself and we were feeling more hopeful. “But then the vet found an ulcer on his eye. “We could see it was taking him so much energy just to keep himself upright so we made the decision based on what was best for him and would stop his suffering. The 17-year-old bird had a ring put on his leg when he was in a nest as a chick in the north-east. After spending his first few years in Africa, he returned to Scotland for the last nine years and successfully raised his own chicks. Mrs Marley said: “Seventeen is a good age for an osprey although there are records of older birds. “We were very aware that even with perfect health Ollie might not have survived his annual migration to Africa but we wanted to give him a chance. “The name Ollie really just popped into our heads at the vets and ‘Ollie the osprey’ seemed to suit him.